Let us take care of all your disposal needs. We can provide your office building, apartment complex, restaurant and/or factory with a variety of disposal and recycling services. 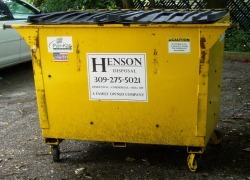 Rear Load Containers - 1/2, 1, 2, 3, 4, 6 and 8 yard dumpsters are available. Route Scheduling - We offer a wide variety of route scheduling possibilities to meet the needs of all our customers. Whether you need your container emptied every other week, once a week, or several time per week - we can handle it for you at a fair price. Which truck would you rather have on your concrete driveway? Less weight = Less damage to your driveway/parking lot! 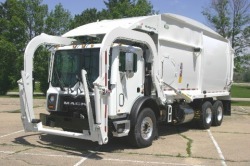 We updated our fleet of garbage trucks in late 2007 & early 2008 to light weight single axle trucks. How does that effect you? It means a LOT less wear & tear on your expensive driveway or parking lots. If our initial quote isn't less expensive than what you're currently paying, we'll beat any competitors price and throw in a month of service free!